By request, here is another update of an earlier post through the August employment report. NOTE: Several readers have asked if I could add a lag to these graphs (obviously a new President has zero impact on employment for the month they are elected). But that would open a debate on the proper length of the lag, so I’ll just stick to the beginning of each term. Note: We frequently use Presidential terms as time markers – we could use Speaker of the House, or any other marker. Important: There are many differences between these periods. Overall employment was smaller in the ’80s, however the participation rate was increasing in the ’80s (younger population and women joining the labor force), and the participation rate is generally declining now. 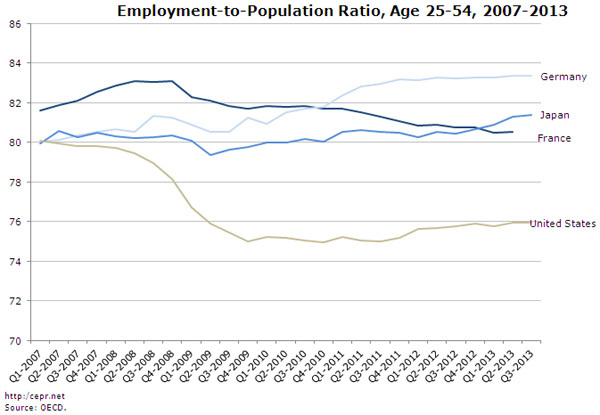 But these graphs give an overview of employment changes. First, here is a table for private sector jobs. The top two private sector terms were both under President Clinton. Reagan’s 2nd term saw about the same job growth as during Carter’s term. Note: There was a severe recession at the beginning of Reagan’s first term (when Volcker raised rates to slow inflation) and a recession near the end of Carter’s term (gas prices increased sharply and there was an oil embargo). 131 months into 2nd term: 10,648 pace. The first graph shows the change in private sector payroll jobs from when each president took office until the end of their term(s). President George H.W. Bush only served one term, and President Obama is in the third year of his second term. Mr. G.W. Bush (red) took office following the bursting of the stock market bubble, and left during the bursting of the housing bubble. 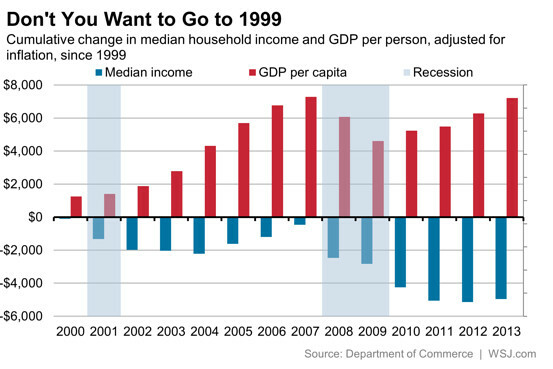 Mr. Obama (blue) took office during the financial crisis and great recession. 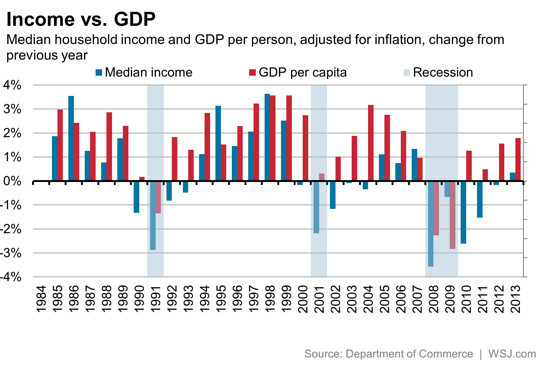 There was also a significant recession in the early ’80s right after Mr. Reagan (yellow) took office. The employment recovery during Mr. G.W. 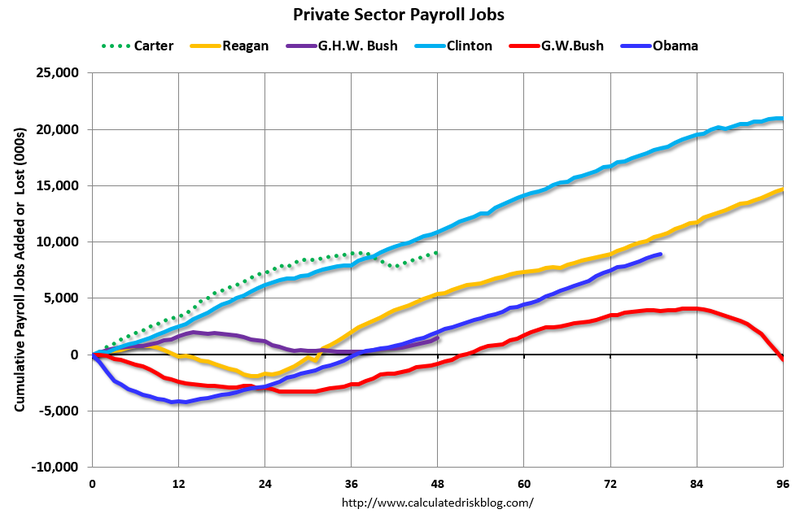 Bush’s (red) first term was sluggish, and private employment was down 844,000 jobs at the end of his first term. At the end of Mr. Bush’s second term, private employment was collapsing, and there were net 463,000 private sector jobs lost during Mr. Bush’s two terms. Private sector employment increased by 20,955,000 under President Clinton (light blue), by 14,717,000 under President Reagan (yellow), and 9,041,000 under President Carter (dashed green). There were only 2,018,000 more private sector jobs at the end of Mr. Obama’s first term. Thirty one months into Mr. Obama’s second term, there are now 8,895,000 more private sector jobs than when he initially took office. The public sector grew during Mr. Carter’s term (up 1,304,000), during Mr. Reagan’s terms (up 1,414,000), during Mr. G.H.W. Bush’s term (up 1,127,000), during Mr. Clinton’s terms (up 1,934,000), and during Mr. G.W. Bush’s terms (up 1,744,000 jobs). However the public sector has declined significantly since Mr. Obama took office (down 584,000 jobs). These job losses have mostly been at the state and local level, but more recently at the Federal level. This has been a significant drag on overall employment. And a table for public sector jobs. 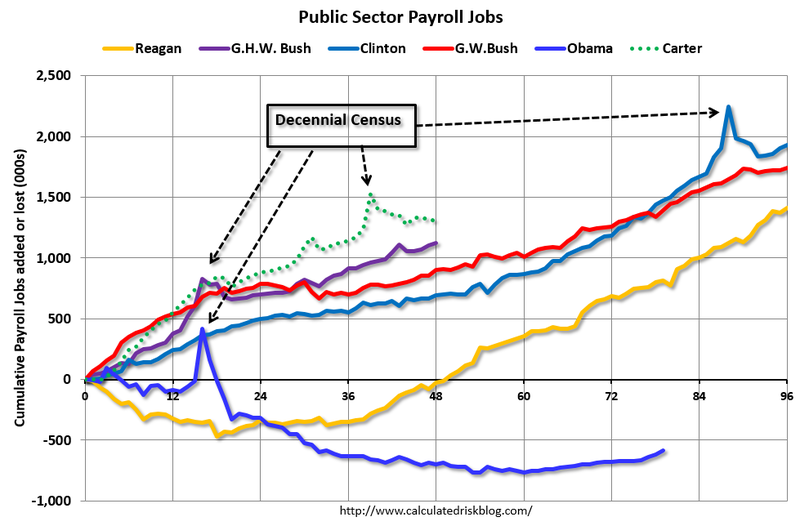 Public sector jobs declined the most during Obama’s first term, and increased the most during Reagan’s 2nd term. Looking forward, I expect the economy to continue to expand through 2016 (at least), so I don’t expect a sharp decline in private employment as happened at the end of Mr. Bush’s 2nd term (In 2005 and 2006 I was warning of a coming recession due to the bursting of the housing bubble). For the public sector, the cutbacks are clearly over at the state and local levels, and it appears cutbacks at the Federal level might also be over. Right now I’m expecting some increase in public employment during Obama’s 2nd term, but nothing like what happened during Reagan’s second term. Below is a table of the top three presidential terms for private job creation (they also happen to be the three best terms for total non-farm job creation). Clinton’s two terms were the best for both private and total non-farm job creation, followed by Reagan’s 2nd term. Currently Obama’s 2nd term is on pace to be the 2nd best ever for private job creation. However, with very few public sector jobs added, Obama’s 2nd term is only on pace to be the third best for total job creation. Note: Only 118 thousand public sector jobs have been added during the first thirty one months of Obama’s 2nd term (following a record loss of 702 thousand public sector jobs during Obama’s 1st term). This is less than 10% of the public sector jobs added during Reagan’s 2nd term! The last table shows the jobs needed per month for Obama’s 2nd term to be in the top three presidential terms. The views of Hayek and Keynes about the causes and consequences of recessions are often presented as opposing. According to Hayek, recessions are working out excessive investments, whereas Keynes regarded them as demand shortages. This column argues that these perspectives are not mutually exclusive. Recessions may reflect periods of liquidation but this could be associated with inefficient adjustment involving unemployment and precautionary savings. Stimulative policy may be desirable even if it delays the full recovery. Millions of people have dropped out of the labor force since the start of the recession in late 2007, and only about a third of them will come back in the years ahead when the economy is stronger, the CBO said in a new report. Examining the evolution of real per capita GDP around 100 systemic banking crises reveals that a significant part of the costs of these crises lies in the protracted and halting nature of the recovery. 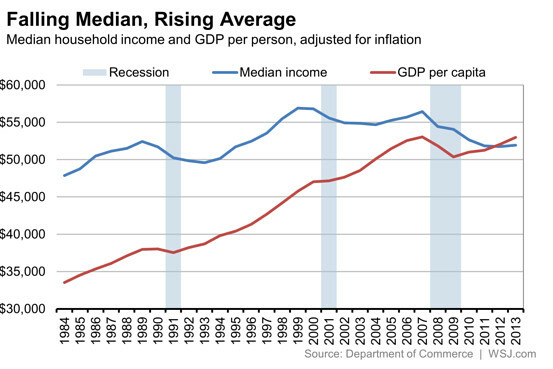 On average it takes about eight years to reach the pre-crisis level of income; the median is about 6 ½ years. Five to six years after the onset of the current crisis only Germany and the US (out of 12 systemic crisis cases) have reached their 2007-2008 peaks in per capita income. In a sample that covers 63 crises in advanced economies and 37 in larger emerging markets, more than forty percent of the post-crisis episodes experienced double dips. The analysis summarized here adds another dimension to an observation we have been emphasizing on the basis of our earlier work—namely, that the subprime crisis is not an anomaly in the context of the pre-WWII era. Postwar business cycles are not the right comparator for the severe crises that have swept advanced economies in recent years. Even after one of the most severe multi-year crises on record in the advanced economies, the received wisdom in policy circles clings to the notion that high-income countries are completely different from their emerging-market counterparts. The current phase of the official policy approach is predicated on the assumption that growth, financial stability and debt sustainability can be achieved through a mix of austerity and forbearance (and some reform). The claim is that advanced countries do not need to resort to the more eclectic policies of emerging markets, including debt restructurings and conversions, higher inflation, capital controls and other forms of financial repression. Now entering the sixth or seventh year (depending on the country) of crisis, output remains well below its pre-crisis peak in ten of the twelve crisis countries. The gap with potential output is even greater. Delays in accepting that desperate times call for desperate measures keeps raising the odds that, as documented here, this crisis may in the end surpass in severity the depression of the 1930s in a large number of countries. The policies of austerity in Europe have failed miserably and many countries there are experiencing a worse slump than during the Depression (austerity in the US has held back the recovery too, but at least there was a little stimulus in 2009, and monetary policy was accommodative). As Reinhart and Rogoff note, higher inflation in Europe (and the US) would help. For more, read the latest Jobs Byte.